The people of the far north, later called Vikings, were first noticed by the Romans around the year 100 BC. [a] This is when the Cimbri and the Teutons moved into southern Gaul. The Romans believed these war-like tribes came from Jutland. But the Romans suspected they were only a part of a greater threat located further north. The Roman historians Jordanes described the destructive Ostrogoths and Visigoths as having come from Gotland. The northern menace survived the fall of the Western Roman Empire. The Frankish Empire that succeeded them in Gaul became more and more aware of the northern threat. As the later Carolingian Empire expanded into northern Germany they came into contact with the Danish people. This is when the Vikings first entered into written history. The first recorded raid in the west was at Lindisfarne in 793. Why the Vikings suddenly began raiding is not completely clear. But a popular theory is the populations had grown to the point there was not enough food to feed everyone. The earliest raiders did not seem to want to move out of Scandinavia. They turned to looting, then returning home. 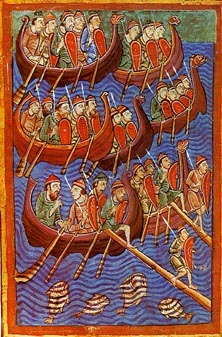 These hit and run raids were made possible because the Vikings were master boat builders and they created flat bottomed boats ideal for journeys up rivers, where many monastic sites lay, ready for plundering. This seems to indicate there was space enough for everyone. Because they found raiding so easy, it became more and more popular among the Vikings. Some English words, and many place names, came from the Scandinavian and Viking language (Norse). For example, the words skirt and shirt came from the word skyrta, meaning a tunic. As English changed, the semantics altered to give us the separate words 'skirt' and 'shirt' we know today. Skin came from the Norse word skinn (which meant to strip the meat off something). Some place-names in the areas the Vikings conquered are still in use. For example, in Yorkshire places ending with thwaite meant a clearing and dale meant a valley. The word thorpe meant new village, such as Scunthorpe. ↑ The Romans of the time believed the Baltic sea was a part of the ocean and lands north of the Baltic were islands. Early writers mentioned an island called Thule. It lay beyond the known world of the time but it is thought now to be Norway. They did not come into contact with Germanic tribes north of the Danube until the 1st century AD. About 98 AD, Tacitus wrote Germania which was an account of the German peoples..
↑ "Thule". Oxford Dictionaries. Retrieved 8 December 2015. ↑ Sawyer, P.H. (1997). The Oxford Illustrated History of the Vikings. Oxford University Press. Oxford, New York. ↑ 19.0 19.1 "Viking Gods". Legends and Chronicles. Retrieved 23 June 2015. ↑ "Viking Gods". Vikings-history.com. Retrieved 23 June 2015. ↑ "Vanir in Norse Mythology". Viking-Mythology.com. Retrieved 23 June 2015. ↑ 22.0 22.1 22.2 22.3 22.4 22.5 Gareth Williams (17 Feb 2011). "Viking Religion". BBC. Retrieved 23 June 2015. ↑ 24.0 24.1 24.2 24.3 "The Vikings meet Christianity". The Viking Network. Retrieved 23 June 2015. Wikimedia Commons has media related to Vikings.